European Mountain Ash is an attractive, ornamental tree. This medium-sized tree produces tiny white-yellow flowers in the spring and decorative clusters of small red/orange berries in the summer. Its bitter fruit is often used to make Rowan Jelly, is a traditional garnish for wild game and venison. Ideal for residential lots, European Mountain Ash will attracts birds to your property. Black Locust is an attractive tree. Its distinctive leaves are made of about a dozen bright green leaflets. It also notable for its fragrant white flowers, which smell of citrus. 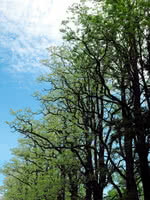 Black Locust can grow in many situations, but prefers dry areas with lots of sun. It is robust and is an excellent choice for establishing shade in dry, open areas. Important note: Much of the Black Locust is toxic to humans and livestock, including seeds, bark, and leaves.